WMAP First-year Paper Figures, Peiris, et al. Temperature-polarization angular power spectrum. The large angle TE power spectrum predicted in primordial adiabatic models (solid line), primordial isocurvature models (dashed line), and causal scaling seed models (dotted line) is shown. 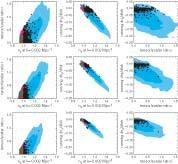 The WMAP TE data (Kogut et al. 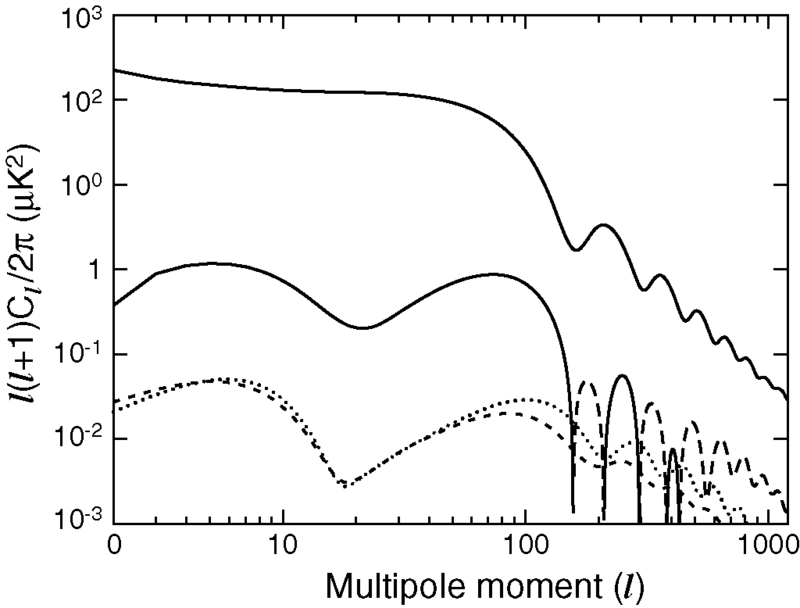 2003) are shown for comparison, in bins of Δl= 10. 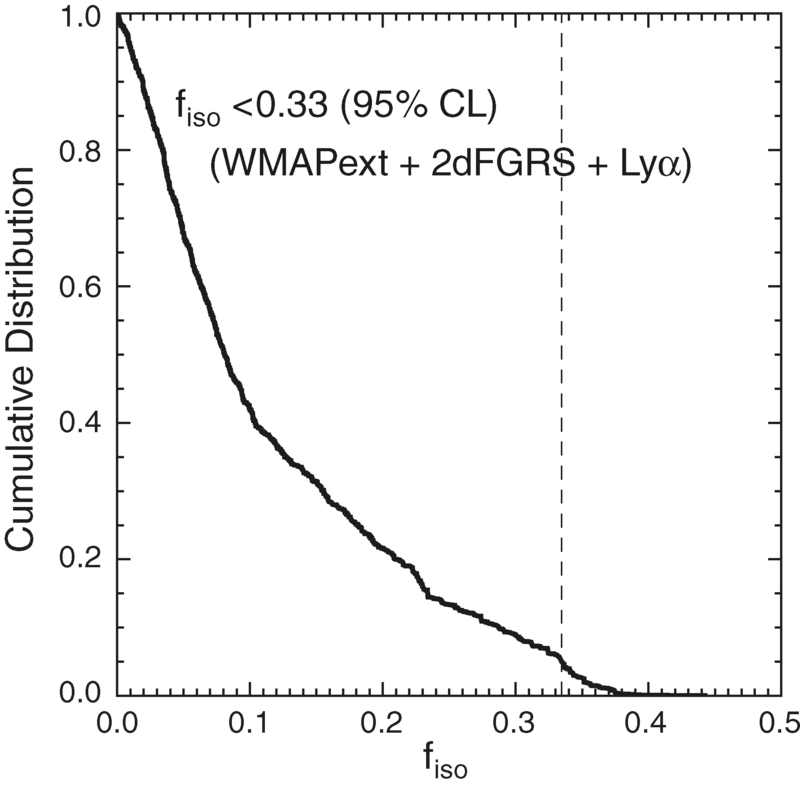 This figure shows n_s as a function of k for the WMAP (left), WMAPext+2dFGRS (middle), and WMAPext+2dFGRS+Lyα (right) data sets. The mean (solid line) and the 68% (shaded area) and 95% (dashed lines) intervals are shown. 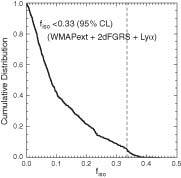 The scales probed by WMAP, 2dFGRS, and Lyα are indicated on the figure. Part of the parameter space spanned by viable slow-roll inflation models, with the WMAP 68% confidence region shown in dark blue and the 95% confidence region shown in light blue. 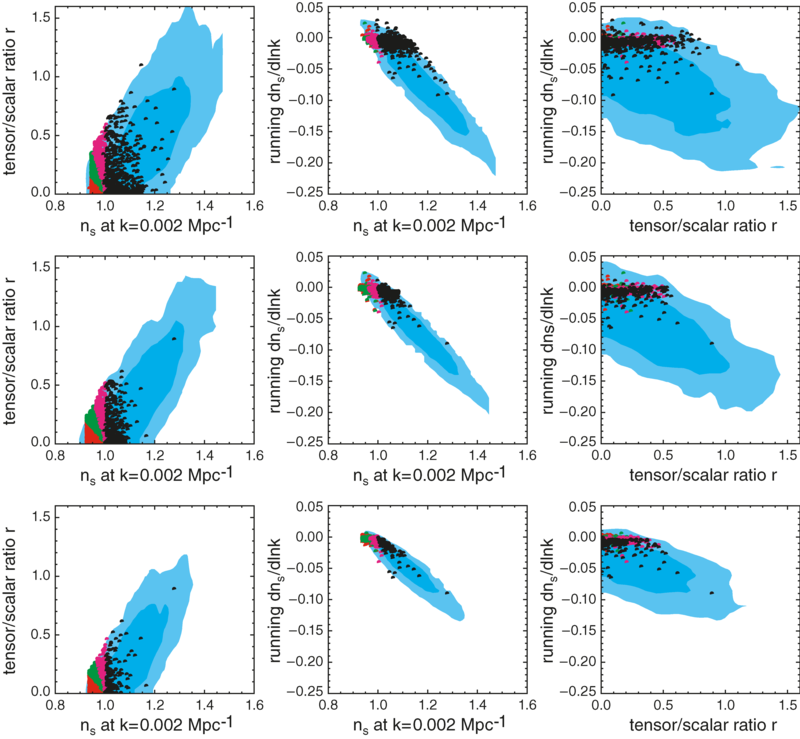 Comparison of the fits from the WMAP(top), WMAPext+2dFGRS (middle), and WMAPext+2dFGRS+Lyα data (bottom) to the predictions of specific classes of physically motivated inflation models. The color coding shows model classes referred to in the text: (A) red, (B) green, (C) magenta, (D) black. The dark and light blue regions are the joint 1 and 2 σ regions for the specified data sets (contrast this with the one-dimensional marginalized 1 σ errors given in Table 1). We show only Monte Carlo models that are consistent with all three 2 σ regions in each data set. 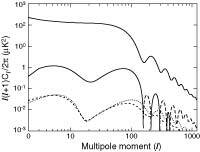 This figure does not imply that the models not plotted are ruled out. Comparison of the fits from the WMAPext+2dFGRS+Lyα data to the predictions of all four classes of inflation models. The top row is class A (red dots). The second row is class B (green dots). The third row is class C (magenta dots). The bottom row is classD(black dots). The dark and light blue regions are the joint 1 and 2 σ regions for the WMAPext+2dFGRS+Lyα data. 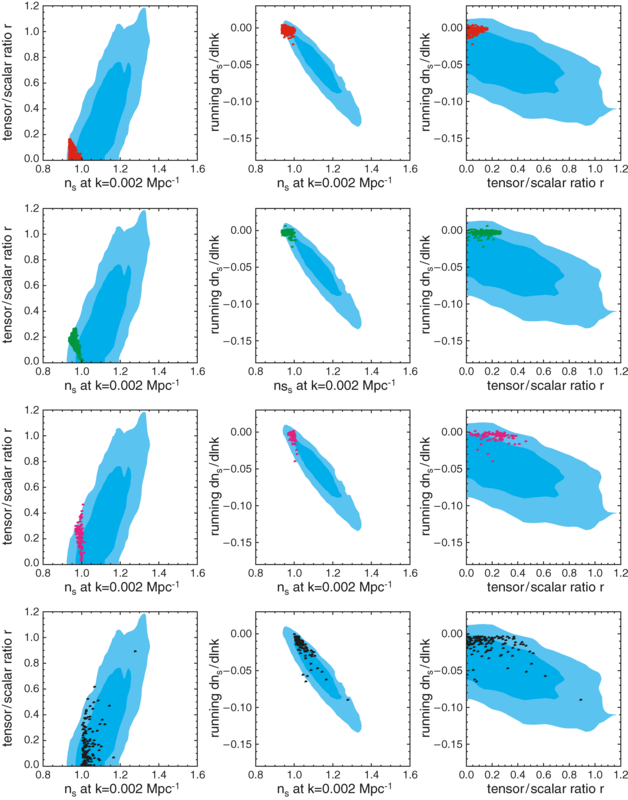 We show only Monte Carlo models that are consistent with 2 σ regions in all panels. 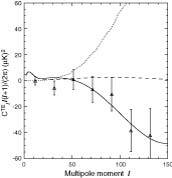 This figure does not imply that the models not plotted are ruled out. Cumulative distribution of the isocurvature fraction, ƒiso, for the WMAPext+2dFGRS+Lyα data set. Best-fit models (solid line) with a step (left) and a dip (right) in the inflaton potential, with the WMAP TT data. 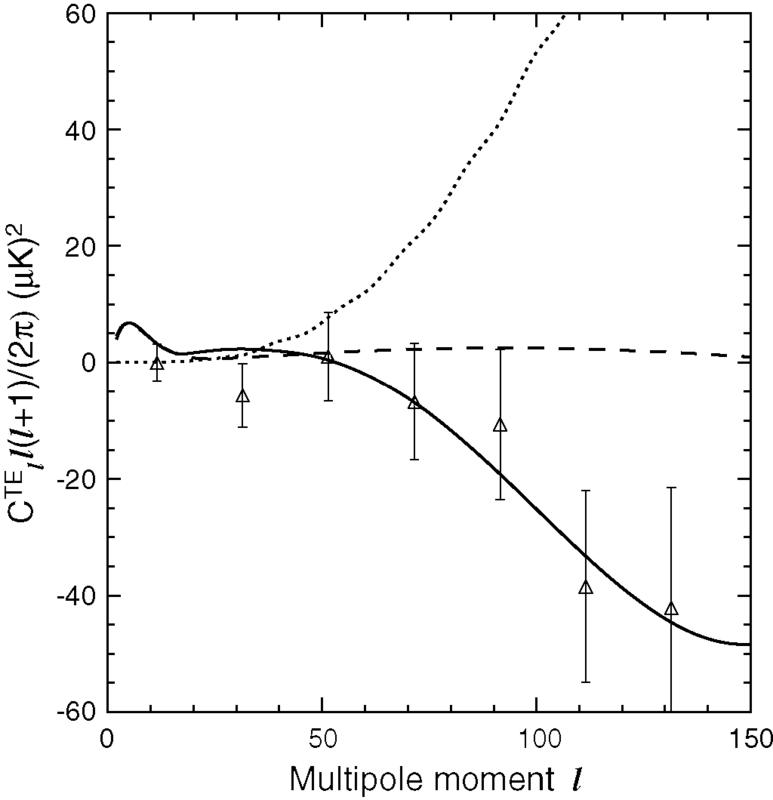 The best-fit ΛCDM model to WMAPext data is shown (dotted line) for comparison. Large-scale structure power spectra for the best-fit potential step (left) and dip (right) models. Tensor power spectrum for the maximum likelihood model from a fit to WMAPext+2dFGRS data sets. The plot shows the TT (solid line), EE (dotted line), and BB (short-dashed line) and the absolute value of TE negative (dot-dashed line) and positive (long-dashed line) tensor spectra.